As of Saturday, June 28, my home Diocese of Charlotte, North Carolina has three newly ordained priests. They are: Father Paul Buchanan, Father Noah Carter and Father Paul McNulty. The Ordination Mass was offered by The Most Reverend Peter J. Jugis, Bishop of Charlotte. Since his episcopal ordination in 2003, Bishop Jugis has focused on four areas of priority for the diocese: the liturgy, catechesis, evangelization and vocations. In stark contrast to many other dioceses, Charlotte fully supports the liturgical tradition of the Church. There is no fear or suspicion of the Traditional Latin Mass, the priests who desire to offer it, or the faithful who are drawn to it. In fact, Father Noah Carter will be offering a Solemn High Mass for his Mass of Thanksgiving. This is the third consecutive year that a newly ordained Charlotte priest will offer his first mass in the usus antiquior. Shortly following the release of Summorum Pontificum by Pope Benedict back in 2007 a dozen priests of the diocese attended a week long seminar to learn the Latin Mass. Since then Bishop Peter Jugis has sat in choir for several Solemn High Masses, publicly demonstrating his support. Currently there are three parishes offering a weekly Sunday Latin Mass, despite a Catholic population of only 175,000 in the diocese. Saturday’s ordination Mass also demonstrated the manner in which the Novus Ordo can be offered when liturgical continuity is sought between the two forms of the Roman Rite. Sacred music from the choir loft permeated the church: from traditional English hymns (such as “All Creatures of Our God and King”), to Plainsong, to Latin hymns. The Ordinary of the Mass was said in Latin as well. Servers for the mass were either seminarians or altar boys from various local parishes. 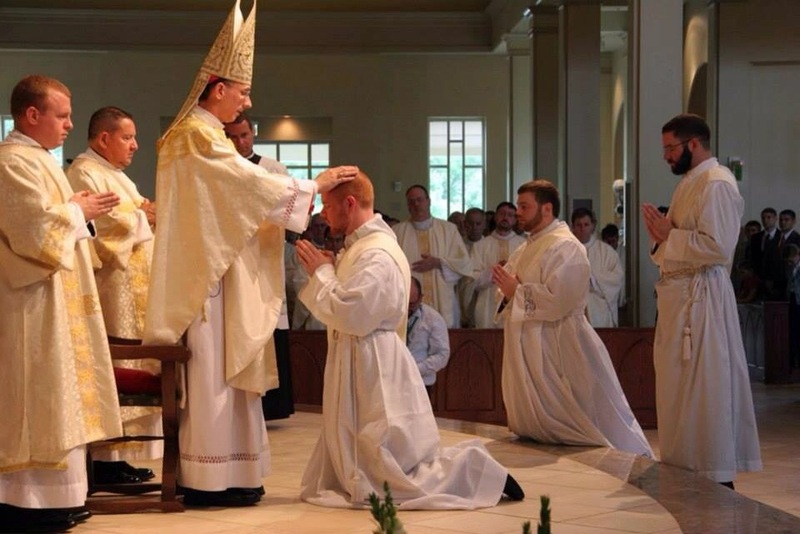 With sixteen young men currently in seminary for Charlotte, and several more entering later this summer, vocations to the priesthood continue to increase. Just this past week the diocese concluded its week long discernment camp at Belmont Abbey College. Nearly 60 young men ranging in age from 15-25 participated in “Quo Vadis Days” to learn more about the priesthood and to help discern God’s will for them. Serving at the ordination Mass were many of those same young men. With every new priest there is much hope for the future. In Fathers Buchanan, Carter and McNulty hope also comes from the qualities and character these young men possess. As they move forward now, priests in the line of Melchizedek, it is important that we pray ever more fervently for them and for all other newly ordained. Deo gratias.